A Yale brand rotary combination dial. A combination lock (or permutation lock, word lock) is a keyless lock that uses a sequence of letters, numbers, or symbols to open the lock. 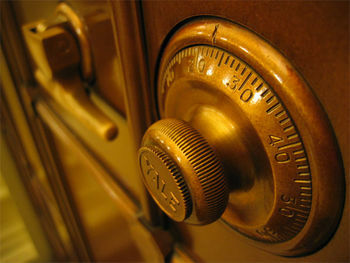 Unlike keyed locks, combination locks require that a user knows the proper sequence of characters to open the lock, much like knowing a password for a computer login. A combination lock works by correctly positioning internal components as the sequence is entered, usually through the use of one or more dials. Combination locks are most commonly associated with safes, but are also popular in low security applications, particularly padlocks. Combination locks are typically compromised via decoding or bypass rather than picking because they offer no direct access to locking components. The earliest combination lock was excavated from a Roman tomb in Athens, Greece. Attached to a small box, it featured several dials instead of keyholes. In 1206, the Muslim engineer Al-Jazari documented a combination lock in his book al-Ilm Wal-Amal al-Nafi Fi Sina'at al-Hiyal (The Book of Knowledge of Ingenious Mechanical Devices). Muhammad al-Astrulabi (ca 1200) also made combination locks, two of which are kept in Copenhagen and Boston Museums. Gerolamo Cardano later described a combination lock in the 16th century. Linus Yale, Jr. contributed the first modern style rotary combination locks in the early 1870s. In 1878, Joseph Loch (Germany) modified Yale's design for Tiffany's Jewelers in New York City. For several decades Loch made many more improvements in the design and function of combination locks. A rotary combination lock uses a single dial which must be rotated left and right in a certain combination in order to open the lock. Rotary combination locks are commonly used on safes, vaults, and padlocks. Contained inside the mechanism are discs, usually three, with notches that must be aligned to allow for a release of the piece holding the lock in place, and the lock to open. The position of the discs are manipulated by turning the dial left and right; on the dial is a catch - a sort of nub - and on each side of the discs is also a small catch. As the dial rotates, there will not be enough space for the catch on the dial to pass the catch on that side of the disc, and so the disc will begin to rotate with the dial. As this disc rotates, its catch will in turn begin rotating the next disc in a similar fashion. Once all discs and the dial are rotating together, the dial is rotated until the last disc is in place and the notch is in the proper positioning, then by rotating the dial in the other direction, the catches will all disconnect, starting from the dial to the first disc and so on until they connect from the other side and the discs begin to rotate together by the same method but in the opposite direction. In this way, the remaining discs are able to rotate and change their position without further disturbing the last disc. The process is completed back and forth until all discs are in place, and the lock is released. In movies, rotary combination locks on bank vaults are commonly opened by thieves using a stethoscope. The principle is that each dial catch will make a small sound when it rotates into position. In reality, safemakers install false click generating mechanisms and sound deadening devices on the catches to make aural detection extremely difficult. This lock is considered to be one of the least secure types of combination lock; many locks of this type can be quickly opened without knowledge of the correct combination. Opening one in this fashion depends on slight irregularities in the machining of the parts. Pushbutton locks uses numbered or lettered buttons to properly align internal components. Pushing each button on the face of the lock rotates one or more wheels inside the lock. A user who knows the correct sequence of pushes can properly align all wheels and open the lock. These locks are popular as standard door locks and padlocks. Pushbutton padlocks are the most common type of lock boxes, common in the real estate industry. The security of pushbutton locks varies; many allow the combination to be entered in any order, enabling a variety of sequences to open the lock. For example, the code '1234' could be entered as '2314', '4321', etc. Electronic combination locks function on the same principle of needing to know the correct sequence to open the lock. In most cases a series of numbers or letters is entered on a keypad. If the sequence is correct, the locking mechanism is released. More advanced electronic combination locks can mimic the function of rotary combination locks, particularly the KABA/Mas Hamilton X series of combination locks, such as the KABA X-09. ↑ US 200,070. Improvement in Tumblers for Permutation-Locks.